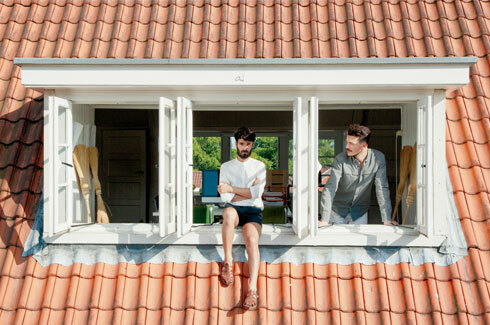 The designer duo at Studio Formafantasma are creating the future by looking to the past. 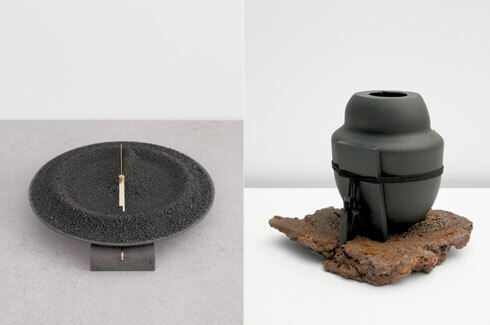 American astronomer and astrophysicist Carl Sagan once said, “Imagination will often carry us to worlds that never were.” For Italian designers Andrea Trimarchi and Simone Farresin of Studio Formafantasma, their imagination takes them the other way, to forgotten worlds. The two designers met during their BA studies in Florence, Italy. They began working together and applied to the Masters of Arts Design course at the Design Academy in Eidenhoven, Netherlands as a team, an unusual approach for sure. 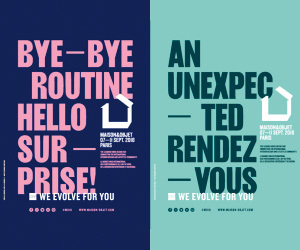 The designer duo is now based in Amsterdam. 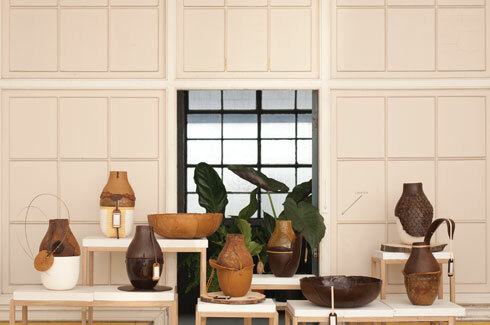 Studio Formafantasma’s first big collection was Botanica (2011). They were commissioned by Plart, an Italian foundation “dedicated to scientific research and innovation in art and design produced in plastic.” The premise behind the collection was the secretions of plants, used as potential raw material. Trimarchi and Farresin dived into the subject and investigated the pre-Bakelite period. They discovered that plant secretions offered some unexpected textures including natural rubber, rosin and polymers like shellac. The Botanica collection has several objects including vases and bowls, designed over the years each with varying textures. The Botanica III (2011), for example, is created out of unglazed ceramic, natural shellac and wood fibres. While one side looks deceptively simple, the other looks like it carries armour to protect itself. 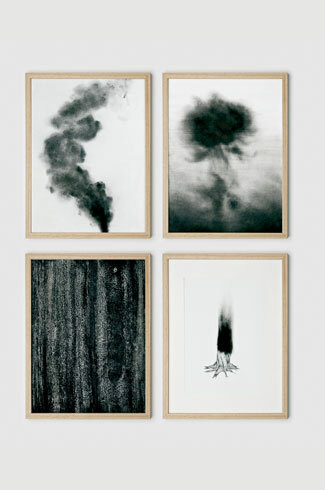 The Botanica I (2011) is much more organic with a coating of resin, shellac and wood fibers. In 2012, the venerable design house Fendi invited Studio Formafantasma to create a collection that explored leathercraft. Craftica (2012) used discarded leather left over from Fendi’s manufacturing processes. They also used leather obtained from fish skins discarded by the food industry, vegetal processed leather using natural substances from tree bark, cork leather extracted from cork trees leaving them unharmed, and a series of animal bladders investigated for their capacity to hold liquids. The leather was paired with marble, oxidized metal, glass, wood or natural materials such as bones, or shells. This series included stools, tableware, lights and furniture. All of the objects in the Craftica collection are utilitarian yet quirky. 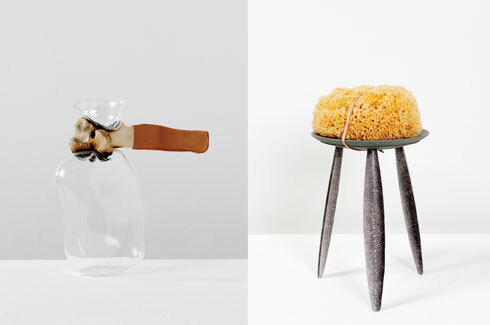 The Sponge Stool is made of wood, leather and…a sponge to sit on. 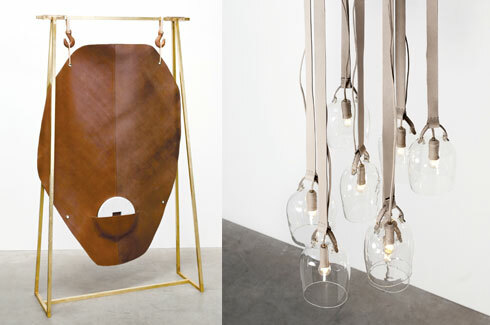 The Bell Lights are inverted wineglasses suspended by leather belts. The Perch or Wolfish stools, on the other hand, remind one of traditional Moroccan tables. The tableware in this collection is stunning thanks to its use of natural materials like scallop shells for spoons. The Denatura Fossilim (2004) collection is a break from the earlier ones but it still has an emphasis on old materials and textures. In this case, they experimented with volcanic lava (which hardens into basalt) from the slopes of Mount Etna – an unusual material for product design. 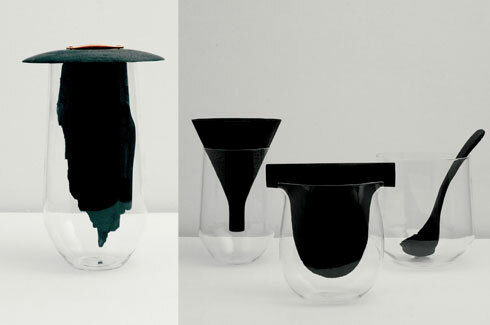 The vases (Alicudi, 2014) are mouth blown lava and Murano glass. The unusually shaped stools and tables have brass strips inlaid in them and the poetic clocks (Monti Silvestri, 2014) are bursting with texture that will make it impossible for you to keep your hands off. The collection also boasts of textiles, mirrors and bowls. It is endlessly fascinating that the designers are using almost-forgotten materials to craft their products. While the world is hurtling towards the future (Jupiter! Juno! 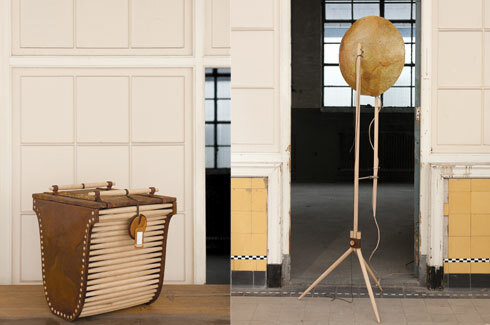 ), it is such a refreshing change to see young designers also looking to the past for tangible inspiration.